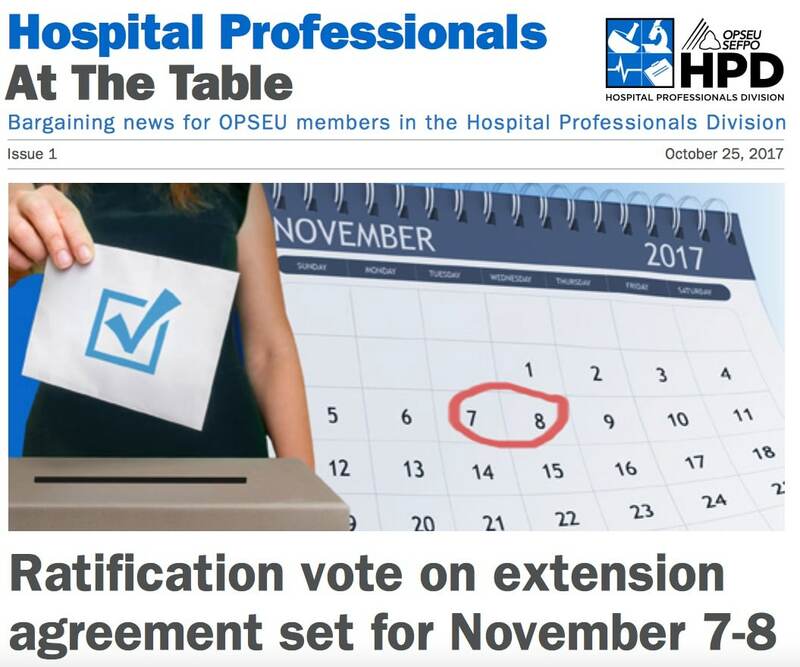 More than 12,000 OPSEU hospital professionals who participate in central bargaining will vote November 7-8 on a tentative collective agreement extension. OPSEU and the Ontario Hospital Association signed the deal on October 11. If ratified, it will extend the current collective agreement, with improvements, by three years, to March 31, 2022. The new agreement covers professionals at 51 hospitals. The bargaining team for the OPSEU Hospital Professionals Division is unanimously recommending that members vote to accept the deal. The extension agreement includes an across-the-board wage increase on April 1 in each year of the extension. Effective January 1, 2018, participating hospitals will pay employees 84 per cent of their regular weekly earnings during the first week of maternity leave while waiting for Employment Insurance (EI) benefits to begin. This eliminates the one week without pay at the start of maternity leave. After the first week, the “top-up” supplementary benefit a hospital pays (above what EI pays) remains the same. Under new EI rules that come into effect in 2018, an employee on maternity/parental leave may opt to extend her leave beyond the current 50 weeks allowable and take less money per week. Where an employee extends her leave, the total amount of top-up she receives from her employer (over the course of the entire leave) remains the same. OPSEU and the OHA will adjust the language in the collective agreement to reflect this change. This new committee will look into updating non-central wage grids. The goal of the committee will be to make joint recommendations to the central bargaining teams ahead of the next round of central bargaining. Some professions are not on a central wage grid: pay rates for the same job differ from hospital to hospital. The new classification committee will be a forum in which the union can make the case for putting those jobs on a central grid at standardized province-wide pay rates. This committee will meet to discuss housekeeping matters, including but not limited to clarifying the definition of Registered Technologist under the OPSEU central wage rates. The parties have agreed that the extension agreement does not apply to local negotiations. Local negotiations will commence no earlier than April 1, 2019 unless otherwise agreed by the parties at the local level. Changes to local agreements must still be vetted by the central parties as per past practice. In bargaining in 2016, the OPSEU Hospital Professionals Division reached a negotiated agreement with the participating hospitals. It was a tough round, but a successful one: we made gains at the bargaining table that we had not been able to get at arbitration in previous rounds. It was the first time in 10 years that hospital professionals had bargained a contract without going to arbitration, and the contract was ratified by 92 per cent of members. This strong contract is the one we hope to extend by an extra three years with this new extension agreement. OPSEU has signed three extension agreements with other divisions in the last five months, and two of them were ratified by an overwhelming majority of members who voted. In light of this, the HPD reached out to the OHA to see if they would be interested in bargaining an extension agreement. They were. We met with them on October 11 and worked out the details. Ontario is less than eight months away from a provincial election. What that produces for us is uncertainty. We don’t have a crystal ball, but to us there is a very real chance that whatever happens in the June 2018 election could have a negative impact on hospital budgets – and all of us who work in hospitals. The idea behind the extension agreement we signed on October 11 was to secure our current contract before the next election. The wage increases achieved in this extension agreement could well be much better than what we might be able to achieve after the next election. With these 1.75 per cent across-the-board increases, we have broken through the 1.4 per cent barrier. We’ve achieved something that far exceeds the industry standard for the past seven years and we are well on our way to being in a better bargaining position in 2022. Maternity leave improvements are important for a bargaining unit that is 81 per cent female. Fixing our classification system will help many of our members who are wrongly classified – and underpaid as a result. And there are no takeaways in this agreement – none. This means no negative impact on our sick plan, our benefits, the short-shift language, or anything else in our collective agreement. OPSEU continues to set the standard for allied health professionals in Ontario. We encourage you to support this extension agreement when you vote November 7-8. Please watch www.opseu.org for specific dates, times, and locations of the vote in your hospital.